The British Museum in London, England exhibits a wealth of cultural masterpieces including famous antiquities and historic documents. These ancient Greek sculptures once adorned the Parthenon in Athens. In the nineteenth century, Lord Elgin shipped them to England. The Elgin Marbles have embroiled the British Museum in a growing controversy. A number of individuals and cultural organizations argue that the museum should return these artistic masterpieces to Greece because Lord Elgin "stole" them (that is, he took them without obtaining proper approvals from the Greek government and people). 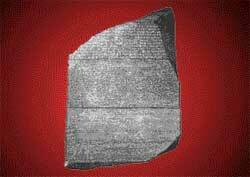 The 2200-year-old Rosetta Stone (see photo above) stands only one meter high but is of towering significance. Its discovery in 1799 enabled archaeologists to decipher the hieroglyphics chiseled on ancient Egyptian temples. This was possible because an identical message is repeated on the Rosetta Stone using three different written languages. One of them is hieroglyphics. Because the archaeologists knew the other two, they learned how to interpret hieroglyphics.